The twelfth sign of the eastern astrology, Pisces, is the most intuitive. As it is also the final sign & brings together many of the characteristics of the eleven Signs proceeding it. Pisces are selfless, spiritual & focused on their inner journey. They tend to get caught up in their dreams & illusions of how things should be & often torn between choices whether to seek the light or sink into the darkness. Compassionate unless pushed to the wall, when they can be very caustic. 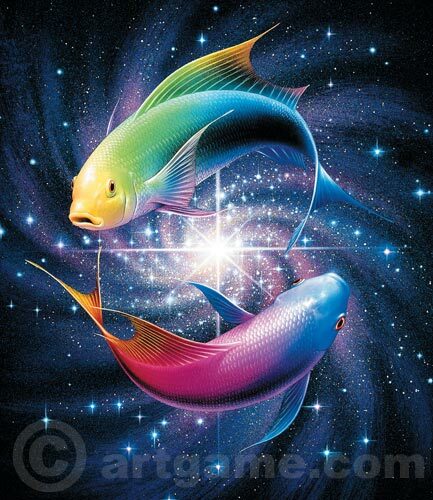 Pisces are liked for their kind & sympathetic nature, their charm & carefree approach. They find the going tough once they have to follow rules or to cope with discipline & are likely to indulge in alcohol & drugs to escape. Some pour out their emotions in creative arts, or in poetry or short verse. They are unselfish, empathic, brave & prefer a lot of independence. They delve in spiritual matters & are fascinated by the occult. Pisces will do well in performing arts, especially in theatre. In science, they tend to work in the fields of either physics or medicine & also do well in ocean-based occupations or working with animals. They normally have talents, which often get them money & fame. They are ever ready to help the needy, without being much concerned for reciprocation. They are often distracted when bored & need to be more focused & inspired to give their best. Pisces are spiritual, charitable, compassionate, empathetic & love to help others in the most imaginative of ways. They also tend to lapse into melancholy if not heard, or into a kind of pessimism that can lead to procrastination & lethargy. They are generally gentle & relaxed people & modest to the point of impracticality, caring & romantic & extremely creative. They crave for fairytale endings, being more in love with the idea of love than being in love itself. Though strongly attracted to good looks, their attention span waivers at unintelligent partners, or at times simply because they secure the object of their desire. Although the unpredictable moods are the reason for some tension at times, the gentle, sensitive, & romantic nature establishes a loving relationship. Kind & affectionate to the spouse & let the partner take on a dominant role in public, but at home, it's the Piscean who rules the roost. The Dragon is a creature of myth & legend. A symbol of good fortune & sign of intense power, the Oriental Dragon is regarded as a divine beast - the reverse of the malicious monster that Westerners felt necessary to find & slay. In Eastern philosophy, the Dragon is said to be a deliverer of good fortune & a master of authority. Therefore, those people born in Dragon years are to be honored & respected. 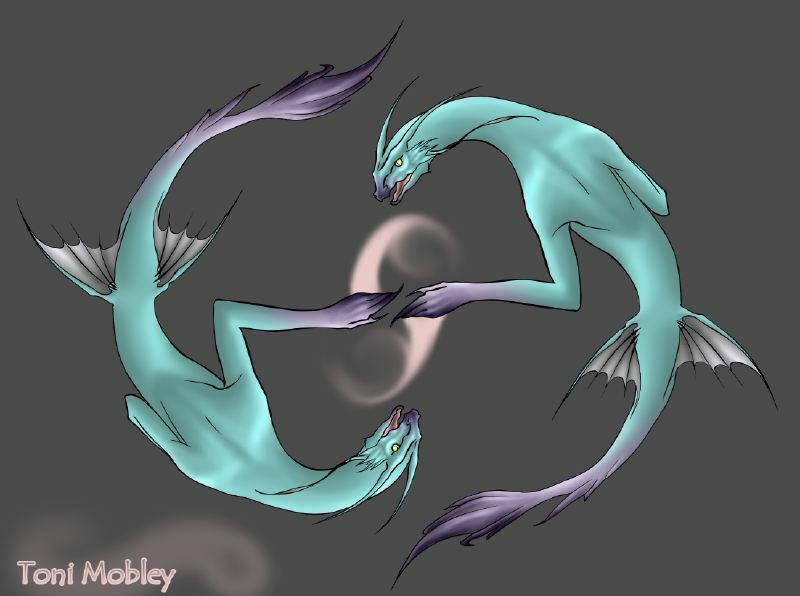 The key to the Dragon personality is that Dragons are the free spirits of the Zodiac. Conformation is a Dragon's curse. Rules & regulations are made for other people. Restrictions blow out the creative spark that is ready to flame into life. Dragons must be free & uninhibited. The Dragon is a beautiful creature, colorful & flamboyant. Often found to be Over-the-Top, the Dragon loves to be center of attention & loves all things rich & expressive, luxurious & fanciful. Most often Dragons are of natural beauty & pose, commanding attention with a natural grace that only a dragon has. An extroverted bundle of energy, gifted & utterly irrepressible, everything Dragons do is on a grand scale - big ideas, ornate gestures, extreme ambitions. However, this behavior is natural & isn't meant for show. Because they are confident, fearless in the face of challenge, they are almost inevitably successful. Dragons usually make it to the top. 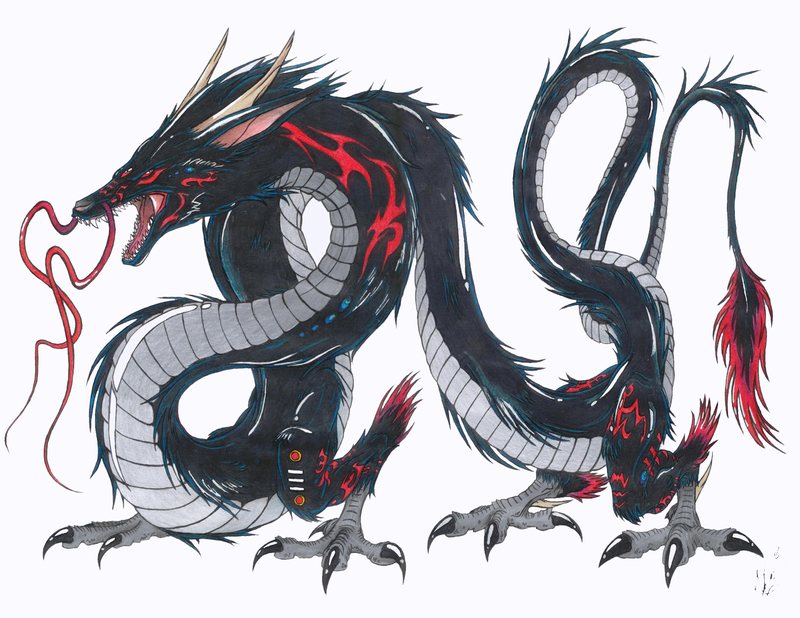 However, Dragon people be aware of their natures. Too much enthusiasm can leave them tired & unfulfilled. Even though they are willing to aid when necessary, their pride can often impede them from accepting the same kind of help from others. Dragons' generous personalities give them the ability to attract friends, but they can be rather solitary people at heart. A Dragon's self-sufficiency can mean that he or she has no need for close bonds with other people. 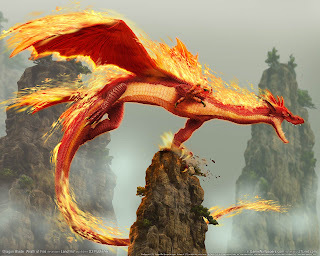 The Fire Dragon is a powerful force to be reckoned with. This is a Dragon doubled! The Fire Dragon can move from calm & collected to combustible in a matter of seconds. In some ways the Fire Dragon is his or her own worst enemy. These Dragons cannot help feeling they are valuable & all-knowing. When they are right their vehemence & vigor is an asset to the cause, & though they value objectivity, they do not always employ the best decision-making measures, & sometimes jump to the wrong conclusion. They also suffer from recklessness & quick tempers. Yet, once they learn to keep their temper, emotions, and rivaling spirit under control, they emanate a commanding influence on other people. 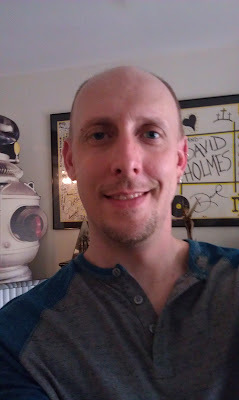 Becoming an inspiration, guild, father figure, & mentor to all, a truly kind & wise dragon. It is described as a bird with a colorful plumage & a tail of gold & scarlet or purple, blue, & green according to some legends. It can have a long life-cycle or short cycles at major life juntions & near the end of which it builds itself a nest of twigs & incents that then ignites; both nest & bird burn fiercely & are reduced to ashes. From which a new, young phoenix or sometimes a phoenix egg arises, reborn anew to live again. The new phoenix is destined to live as long as its old self. In some stories, the new phoenix embalms the ashes of its old self in an egg made of myrrh & gives this gift to those most in need of a life change. It is said that the bird's cry is that of a beautiful song. 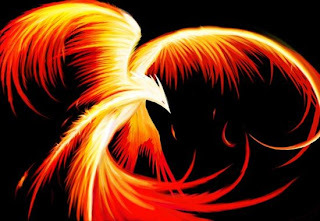 The Phoenix's ability to be reborn from its own ashes implies that it is immortal, though in some stories the new Phoenix is merely the offspring of the older one. The Phoenix represents birth, death, new life, change & power from within. 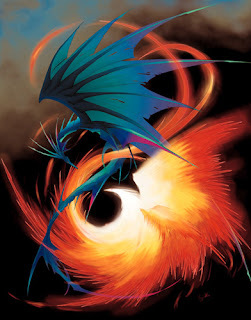 Together, the dragon & phoenix symbolize Yin and Yang together: perfect balance. Standing alone, each symbol is hugely powerful. Together they represent a power- packed union of success, prosperity, friendship, love, & enlightenment. Emboding the same soul both strive toward their goals with unwavering eyes. Ready for battle & death & life in one seamless movement. Yay! New blog! Someday I will get back to mine... Glad your keeping a new one! I am Pisces Fire Dragon....feb 26 1976... Where does the Phoenix come from? I am also born February 26, 1976. Hi,Iam still confused by the phoenix bird. it is new to me i recently found out it is in neptune and has come to me as a vision first of eagle. So i looked uo symbol of eagle then came across more symbolic bird and phoenix came across and Iam intrigue i havr had a dramatic destruction and change. Iam a pisces. in google and i see it has to do with me so if you can give me more explanation my birthday is feb 28 1989 if i can have your help with this please contact me?